Ahoy me hearties! It&apos;s a pirate party! 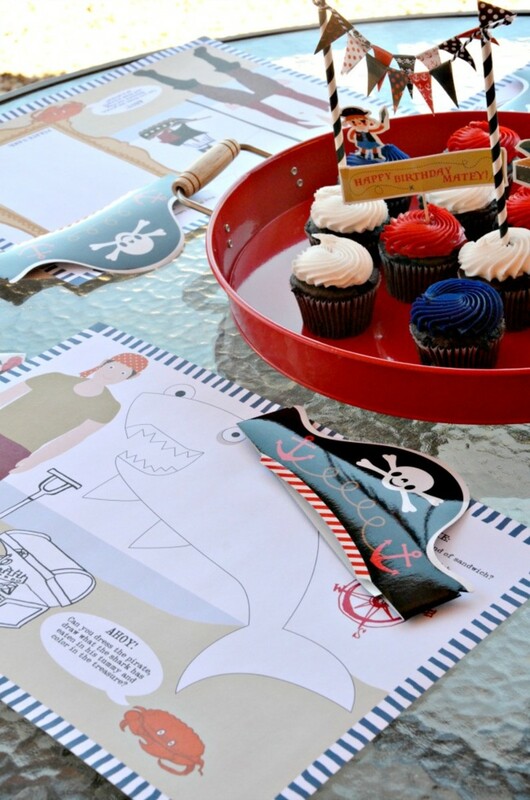 This cute pirate party is the perfect mischievous theme for your mischievous little buccaneer. 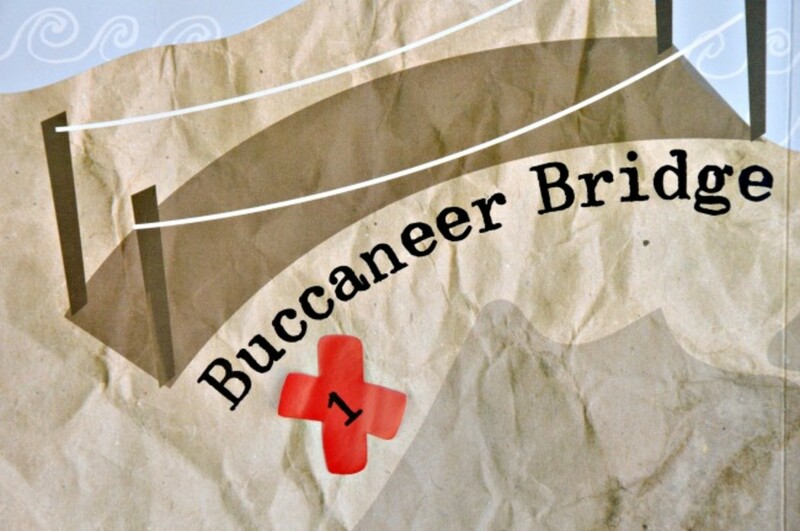 Landlubbers and salty sea dogs are going to love this adventure on the high seas! See all our details below. 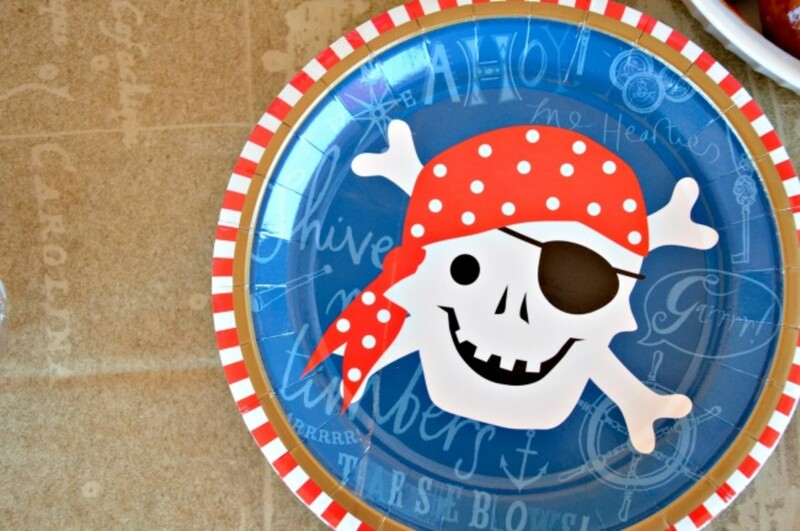 We found the perfect pirate party supplies at Imagination Lane. 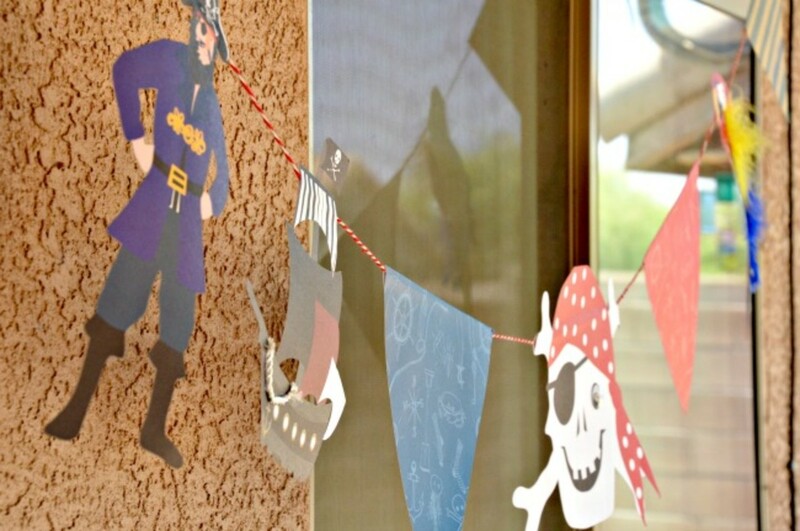 Their pirate decor is fun without being too babyish or too scary looking. I love the skull with the red bandana and eye patch as the main character. He adored the plates and banner. 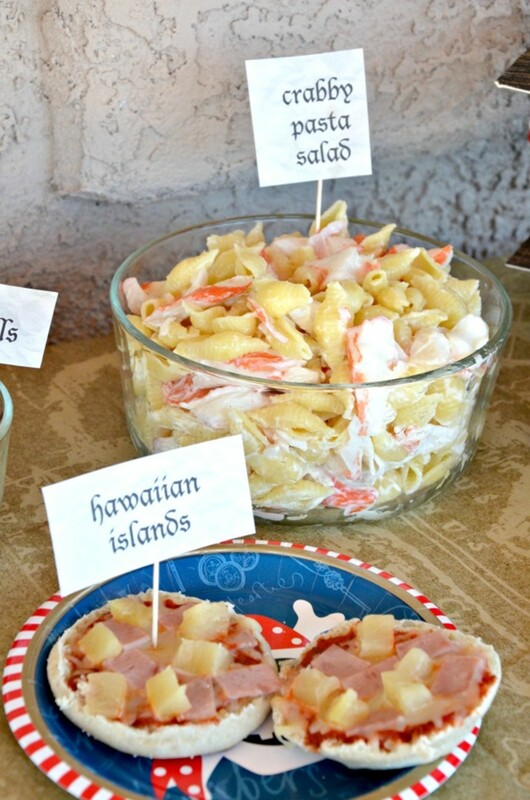 If you&apos;ve seen any of our other parties, you know we love themed party food. 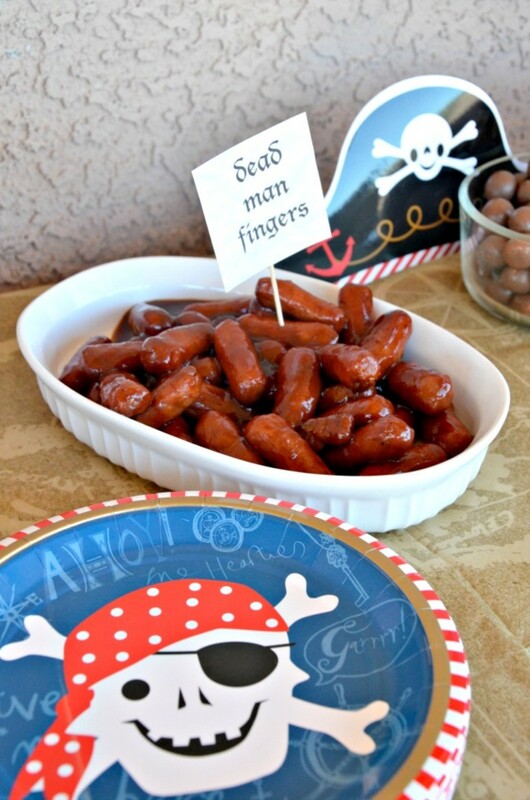 We made lots of pirate yummies that we served on our blue plates with the skull and trimmed with red stripe. The tablecloth looked like a old giant treasure map. 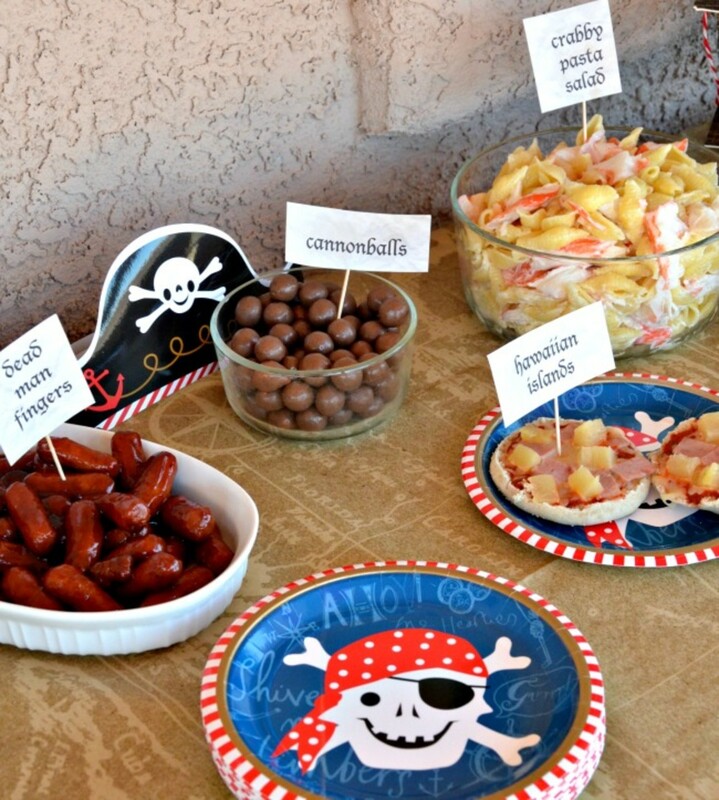 Our pirate menu consisted of crabby pasta, hawaiian islands (pizza), dead mans fingers (mini sausages in bbq sauce), cannonballs (whoppers), walk the plank (jello with gummy sea creatures), fish &apos;n chips (goldfish and chips) and cupcakes. 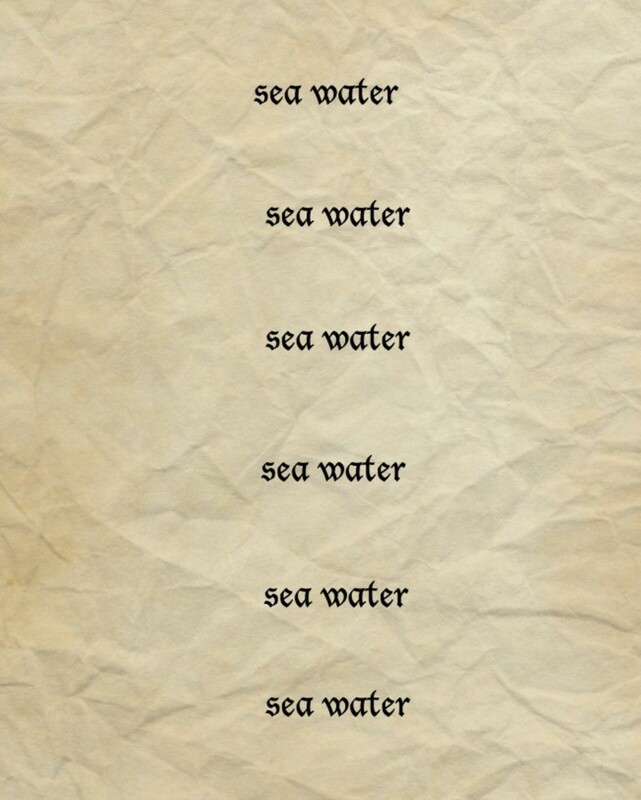 We also served "sea water" to drink. What else do you think pirates drink? Just kidding... Please let your kiddos know that it&apos;s not real sea water, my daughter was immediately worried for our safety. Ha! All of the products from Imagination Lane are very high quality and made of thick, sturdy material. I really loved their pirate banner. It is large, measuring 8 feet long. The banner has a few extra little details like a rope on the boat, goggly eye on the pirate skull and feathers on the parrot that made it feel more homemade. The characters and pennants are strung on a red and white twine string. 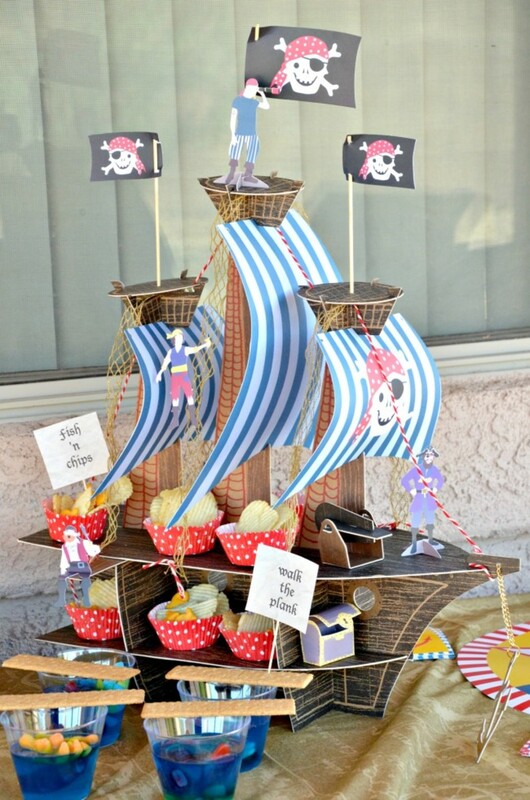 I think my FAVORITE part of this whole party was this amazing pirate ship centerpiece and cupcake stand. It took a few minutes to assemble but it was totally worth it. 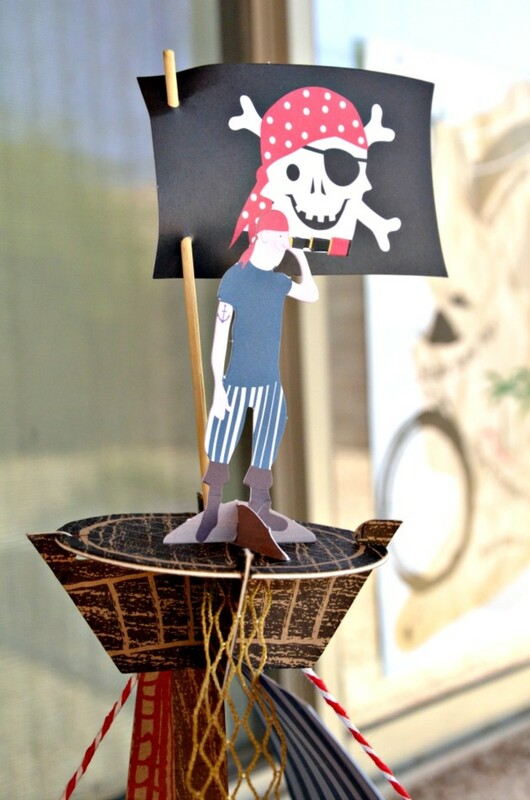 Check out all these intricate details that makes this pirate ship rock! Are you as impressed as I was?! It&apos;s rad right?! It&apos;s even more impressive in person! It features an upper and lower deck, red and white twine, 3 blue pirate sails, ladder netting, 3 crows nests, 3 black skull flags and wooden sticks, a treasure chest, a cannon, 3 pirates and a plank! 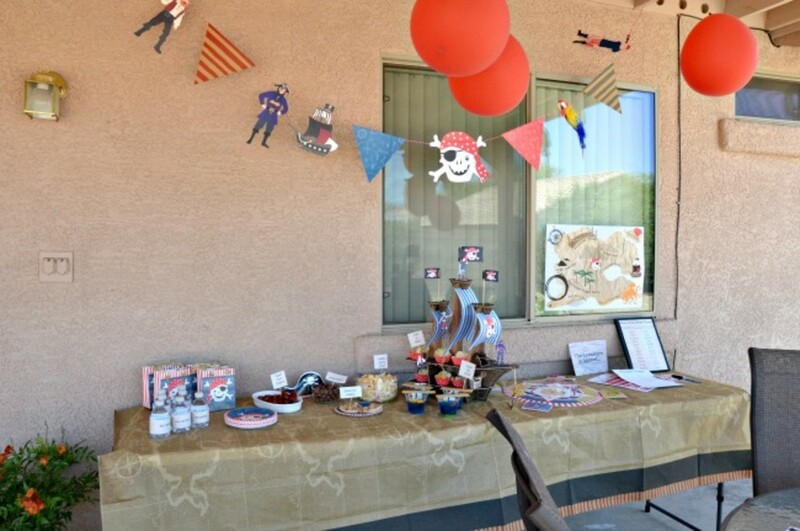 I love it so much it makes me want to have a pirate party every year. Hey, it could be our summer themed party! 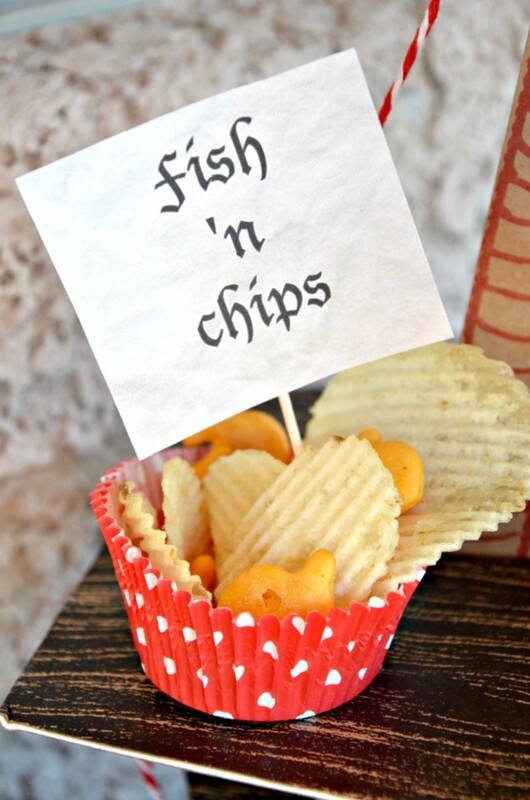 Since we served our cupcakes on a tray, we used our pirate ship to serve "fish &apos;n chips" in cupcake wrappers. 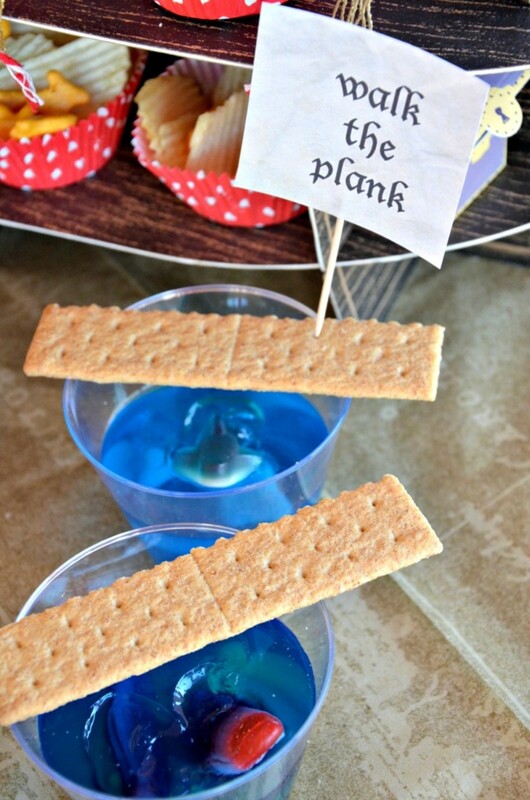 Around the pirate ship we also had "walk the plank" jello cups which had gummy sharks, octopus and swedish fish, topped with a stick of graham cracker as the plank. 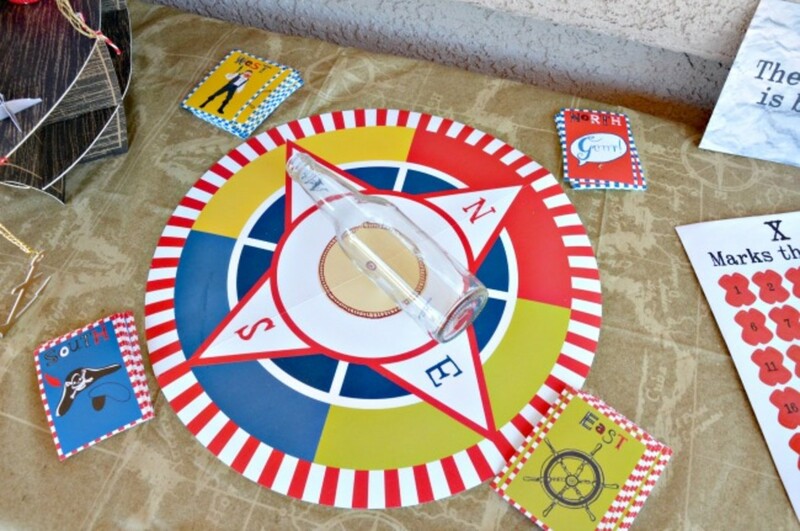 Instead of coming up with our own games we opted to get the pirate entertainment pack which included 8 fun pirate activity placemats (more on those later) and TWO different games - a "spin the grog bottle" game and "where be the treasure" game. Totally worth the reasonable $14.99 price tag! 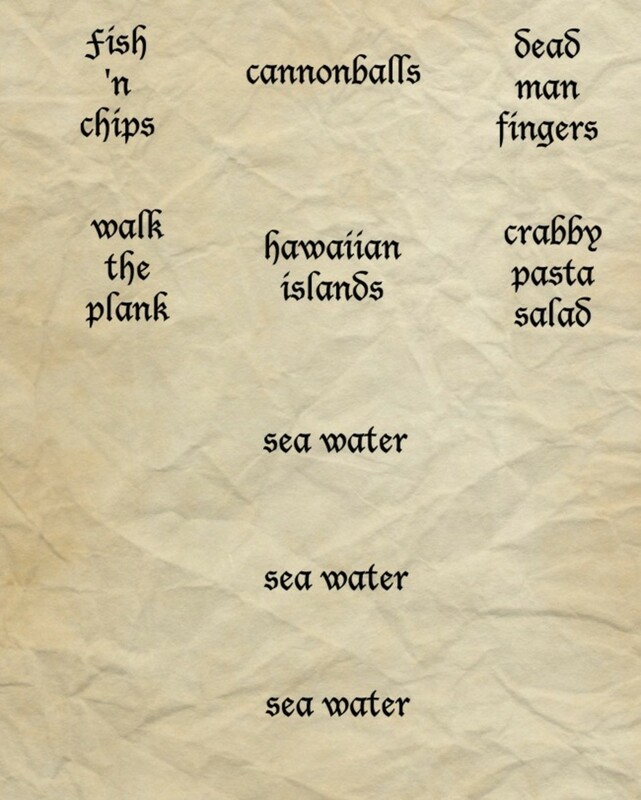 The first game was a treasure map game. Before the game starts the parents decide where the "hidden treasure" is going to be on the map and mark it on the little map inside the envelope. 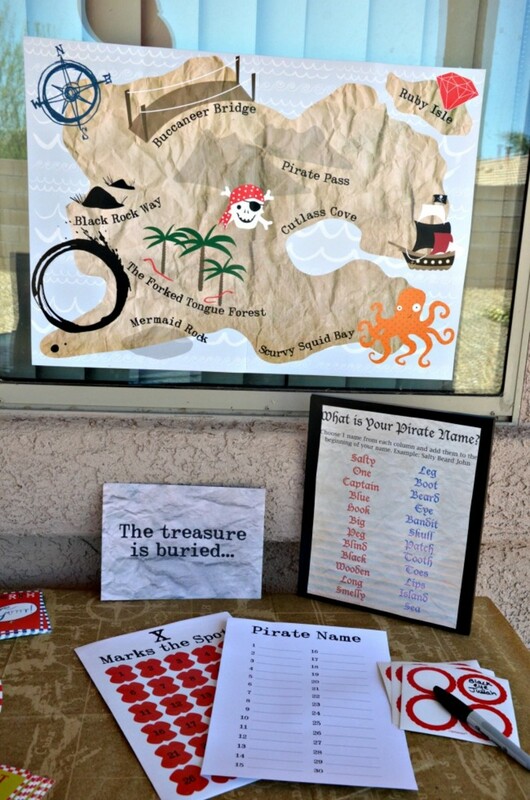 It comes with a large treasure map you can put on a wall or table that the little pirates use it to take guesses as to where the treasure is hidden. They mark their guess with the special "x marks the spot" stickers. 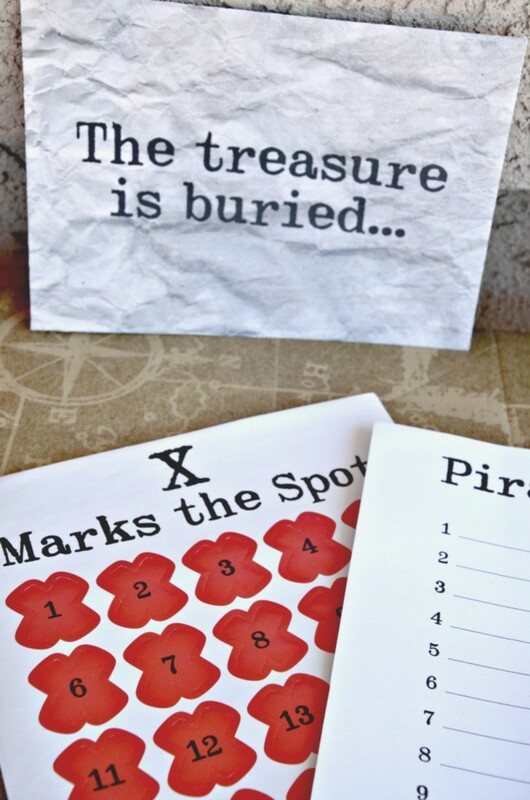 The pirate that guesses closest to the hidden treasure wins the game! 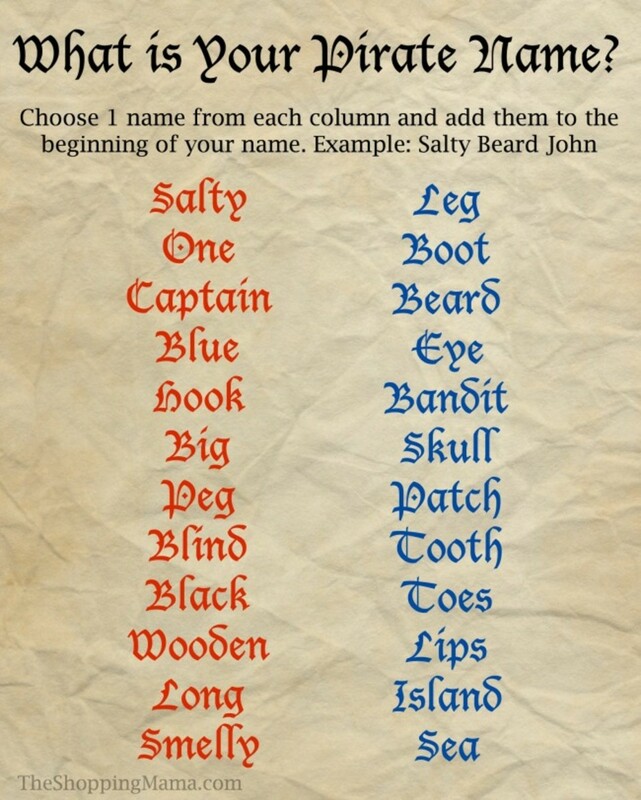 To make our pirate party a little more unique I created a "What is Your Pirate Name?" printout that I framed and had on the table. 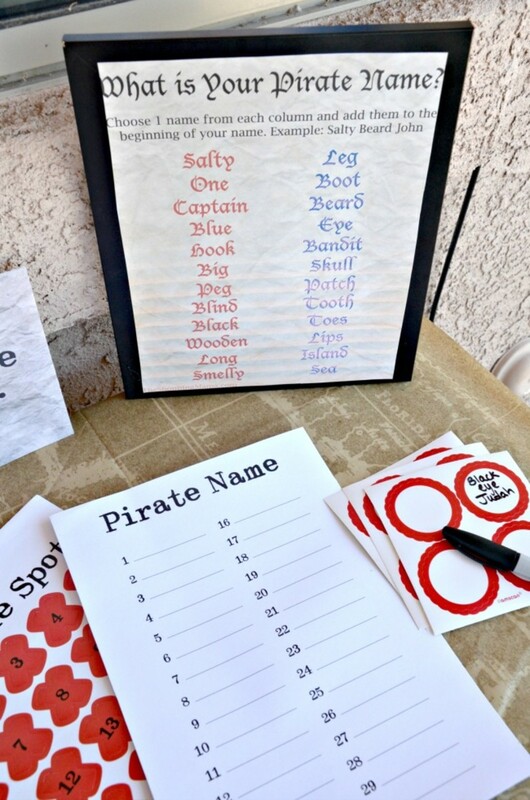 Each little buccaneer gets to create their own pirate name choosing one name from each column and then adding them to the beginning of your name. Are you going to be Salty Toes Michael or Blind Bandit Sophia? I picked up some red and white stickers for them to write their names and wear them around the party. Of course my printer decided to run out of ink the day of the party and so my ink isn&apos;t as vivid as it should be once I printed it out. That&apos;s what I get for waiting until the last minute. But, you can still get the free printable at the bottom of this post and maybe your printer won&apos;t run out of ink like mine did! 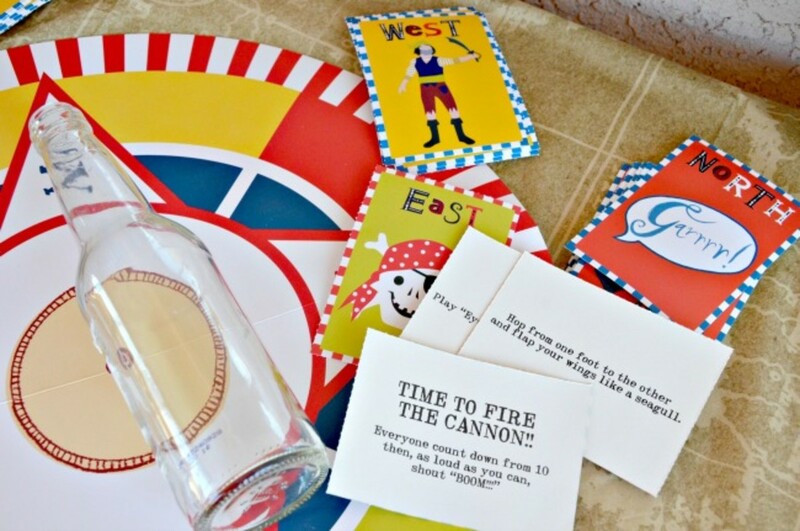 The pirate entertainment pack also came with a fun spin the bottle pirate game. The only thing you need to provide is an empty bottle. Take turns spinning the bottle and whichever direction the bottle points you choose a card from that stack. The cards have fun pirate themed activities on them like acting like a seagull, calling out shark (everyone has to move to the other side of the room) or collect a shiny treasure. Definitely a fun game. We didn&apos;t want to stop playing it! 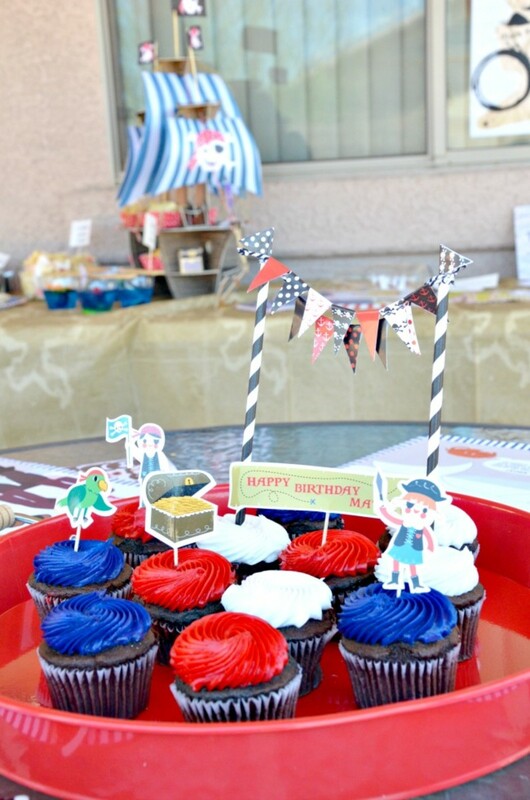 We served simple cupcakes in red white and blue colors and decorated them with the cake bunting and pirate set that came with 5 pirate themed toppers and a mini flag bunting. 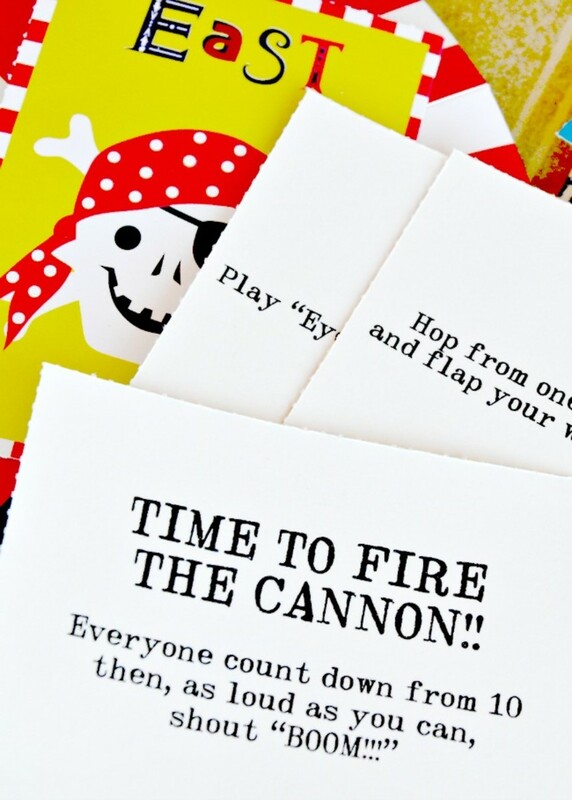 Each place was set with one of the 8 placemats from the pirate entertainment pack which were an activity within themselves. 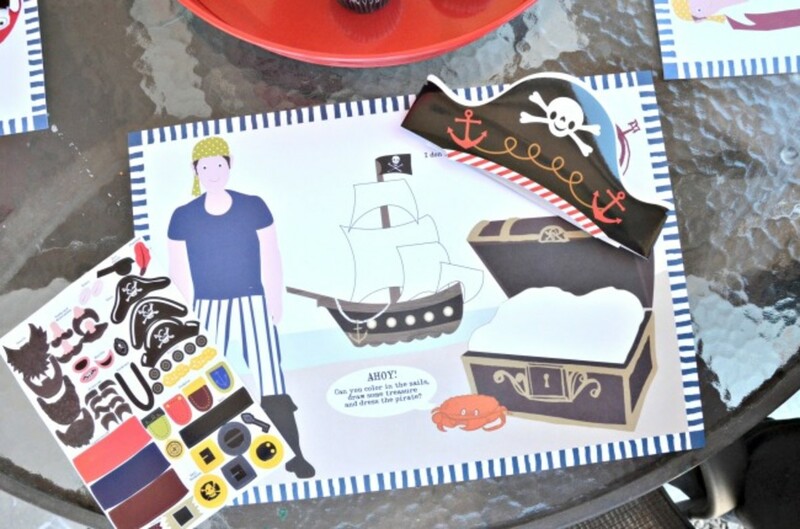 Each child could decorate their pirate with stickers and then doodle and draw on the placemat. There were 4 different designs. A great activity for kids to do while waiting for all the guests to arrive. We also had little paper pirate hats too. Arrgh! If you liked my "What is Your Pirate Name?" printable and labels you can print your own with my free printables. Click on the images and print the full sized image from that page. Cut the food names to size and tape a toothpick to the back of the label. 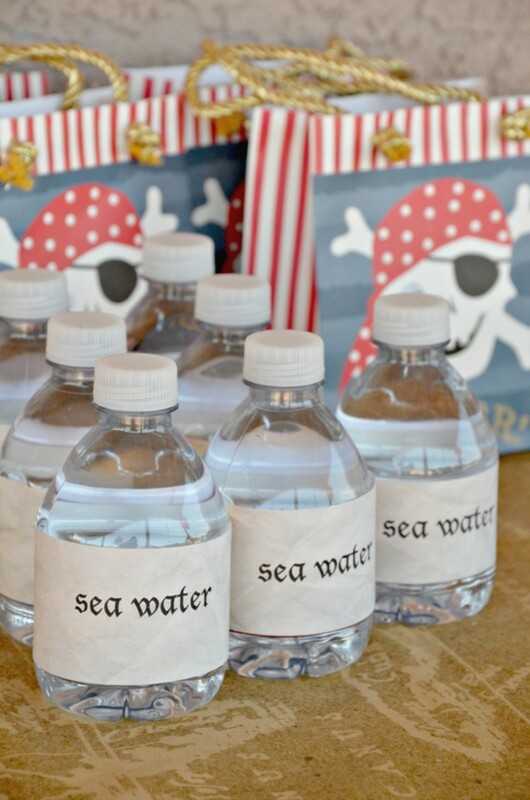 The "sea water" labels can be cut straight across and taped around a small water bottle. Shop! 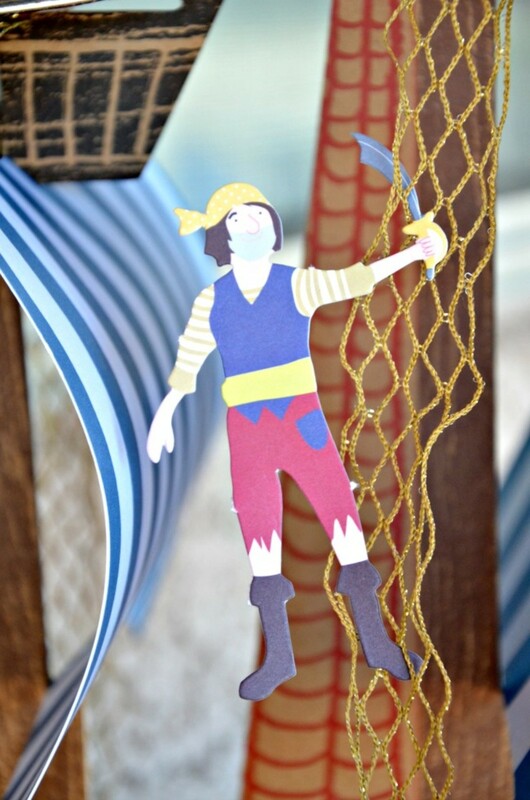 Visit Imagination Lane for this and other fun party supplies and ideas. Where creativity meets style! Check out all of our birthday party inspiration. 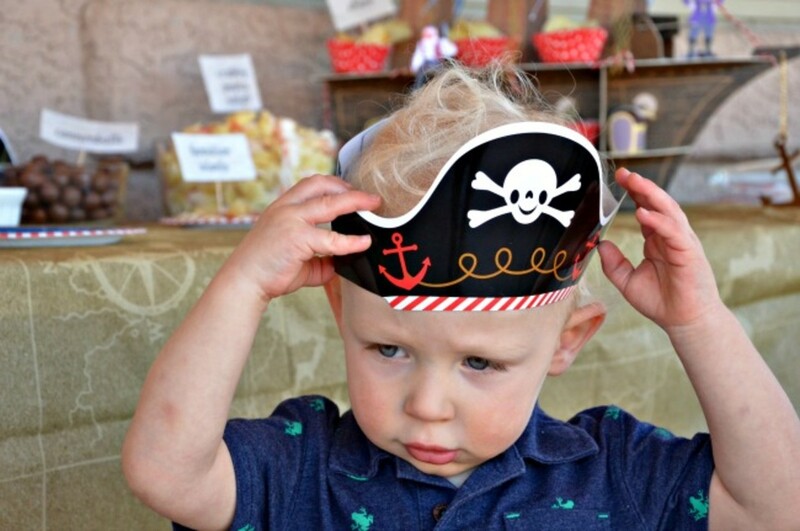 You may also like our Pirate and Mermaid Party.